That İstanbul is a real treasure chest for history, art and architecture freaks is no secret. Its colorful mosaic of historical city structures -- mosques, churches, synagogues, palaces, castles and towers -- reflects the many, many social and cultural influences of a number of foreign communities that have left their indelible footprints across the city throughout its long history. Already, in 685 B.C., settlers from the ancient Greek town of Megara chose to colonize the town of Chalcedon, in today's Kadıköy district, thus aiming to secure the Bosporus as a channel of trade between the Greek polities and the Black Sea region. Some years later, in 667 B.C., famous Greek King Byzas went on colonizing the European side of the Bosporus further, thus founding the city of Byzantion. Two prominent examples of ancient Greek architecture are the Serpentine Column and Leander's Tower. Being approximately 2,500 years old, the Serpentine Column is said to be İstanbul's oldest remaining Greek monument. Erected to honor the triumph of the Greeks over the Persians at Plataea, it originally stood at Delphi (both ancient cities on Greek ground) and was moved to İstanbul in 324 AD by Constantine the Great to mark the declaration of the new capital city of the then-founded Roman Empire under the name of Constantinople. The originally eight-meter-high piece was made up of three intertwined serpents which supported a golden bowl. The bowl is believed to have been lost or stolen when the city was sacked during the Fourth Crusade. Some say the heads were hit and cut off by a drunken nobleman in the 17th century but one of them can still be seen in the İstanbul Archaeology Museum. The rest of the column can be found today at the Hippodrome in the Sultanahmet quarter. 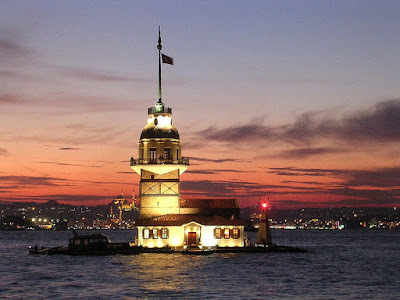 Surrounded by no fewer stories is Leander's Tower, often referred to as Maiden's Tower and located offshore in the Bosporus in the Üsküdar district. It was actually built in 408 B.C. by an Athenian general to control Persian ships sailing along the Bosporus. Another more well-known story is that of a sultan who erected the tower to protect his daughter from a snake bite, predicted by an oracle. But, as the story goes, there was no way to escape destiny: On the day of her 18th birthday, the sultan brought his daughter a basket of fruit as a gift and hiding within it, of course, was the predicted snake. The tower, which also contains a small, romantic restaurant, can be visited today by taking one of the small boats that sail from the nearby shore. However, with the fall of Rome in 476, all that remained of the Roman Empire was its eastern part, which then came to be known as the Byzantine Empire. Distinctly Greek in culture and the center of Greek Orthodox Christianity, its capital, Constantinople, was adorned with many magnificent churches, including probably the most well known, Ayasofya (Hagia Sophia), once the world's largest Christian cathedral. Other important churches that were built later on under Byzantine rule include the Pammakaristos Church, which is now Fethiye Mosque in the Çarşamba neighborhood of today's Fatih district, and the Church of St. Savior in Chora, situated in the western Edirnekapı district of İstanbul and especially famous for its beautiful mosaics and paintings. After the capture of the capital of the Byzantine Empire by the Ottoman Empire, under the command of Sultan Mehmed II (Mehmet the Conqueror) in 1453, naturally many city structures were destroyed. Mehmed's main concern with İstanbul had to do with rebuilding the city's defenses and re-population, and he soon devoted much energy to bringing prosperity to İstanbul. In 1459, he sent out orders that any Greeks -- as well as Slavs, Jews and Armenians -- who had left İstanbul as slaves or refugees and whose diverse skills were needed now to transform the city into a flourishing capital of the empire were allowed to return to the city. According to a census of 1477, there were 9,486 houses occupied by Muslims, 3,743 by Greeks, 1,647 by Jews, 267 by Christians from Crimea and 31 by Gypsies. Nearly every third inhabitant of the city was Greek at that time, so the Greek population played a significant role in the social, political and economic life of the city and the multiethnic, multi-religious Ottoman Empire in general. The leader of the Greek community within the empire officially became the Ecumenical Patriarch of the Greek Orthodox Church, which was moved to the Church of St. George in İstanbul's Fanar district in 1586. The patriarchate complex includes the authorization offices, the patriarchate library, the financial offices and the public enterprises of the patriarchate and the Cathedral Church of St. George. The church is definitely worth visiting. It is especially famous for its priceless artifacts and relics, which include the patriarchal throne, believed to date from the fifth century; three rare mosaic icons; a fragment of the Pillar of the Flagellation to which Jesus was tied and whipped; and the coffins of three saints. Further on, the Greek High School for boys on the top of Fanar hill became an important educational institution to educate young Greeks for Ottoman bureaucracy and Orthodox clergy as well. The Yoakimyon High School for girls and Marasli Greek Elementary School next to the patriarchate are other schools that can still be found in the district. As you see, the list of Greek footprints in İstanbul seems endless. To start tracing them back, just take a small tour of Fanar -- you will come across an incredible number of smaller, more or less well-preserved churches, and you can still find a few of the typical, small Greek single-family houses, recognizable by their finely decorated facades. Just take a look -- it's well worth it!